Handcrafted Metal makes conical color coated range hoods that are customized to accommodate your kitchen and your taste. With us you can customize every dimension and feature, such as hammering, color tone, and lighting. To further customize your color coated range hood you can also choose from additional features, such as elegant bottom bands, hand-wrought straps, clavos, and rivets. Personalized features like these are guaranteed to please. Our color coated range hoods are made with the highest-quality materials available, and are very durable. We will work with you to make a superior color coated hood that looks splendid in your kitchen. Click on any conical hood below to see more pictures, and customize it according to your specifications! 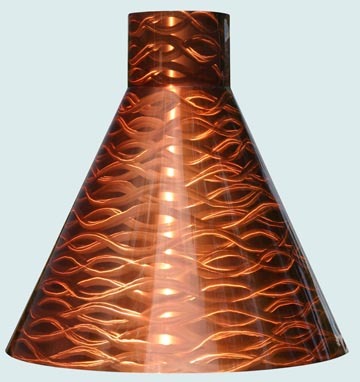 This stunning conical hood features our brilliant orange translucent color coat over our custom wave pattern. We offer this finish in a variety of hand-applied patterns and custom colors. The base hood is stainless steel. The color coat is transparent and allows the detailed pattern of the underlying metal to show through. The pattern appears iridescent and changes continuously when viewed from different angles. The high gloss finish utilizes an industrial clear coat with custom mixed coloring.